Anyway, back to the little issue of hotel room air conditioning. Here we are, my family and I, checked into a middle-level hotel in a hot area. The windows, of course, don’t open. The room is warm, and we sleep better if we’re cold. As do, in fact, most humans. But we want the curtains closed, because humans also sleep better in the dark. So we turn on the air conditioner, which then proceeds, with enthusiastic grunting, to cool . . . the curtains. 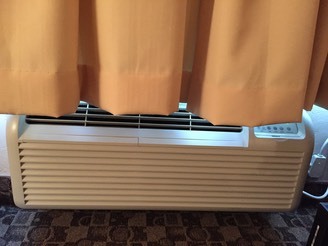 And it will cool them with thoroughness and exuberance all night long, unless I use the hotel guidebook for a purpose that it was not intended, and prop it up against the curtains so that at least an 11 inch portion of the 30 inches of air conditioning is headed to the room. My theory is that the designers of hotel rooms like this sleep in nicer ones with central air, and only visit these during the day. And during the day, the whole curtain/air conditioner thing is completely different. The curtains are open, or only the sheers are pulled, so the air wafts beautifully around the room, regardless of the corresponding beauty of the furnishings or over-the-bed oil paintings. We need a curtain holder - a bar installed on the wall that we can lower to pinch the curtains back, a cage over the air vent that opens and keeps the curtains at bay. Some sort of designed equivalent to the hotel guide propped against the window. 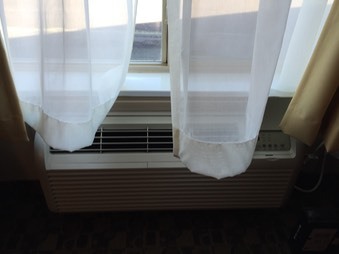 Because if we who are lucky enough to have power and hotels and air conditioners can figure out how to use them more efficiently, it will help this little problem, and it will start to help the big Problem of energy consumption and climate change.